Cycling through the valleys of the Main, Rhine, and Neckar Rivers! On this tour, you will bike and barge through the valleys of the rivers Main, Neckar, and Rhine, from Ludwigsburg on the Neckar river to Frankfurt/Offenbach on the Main river. You begin in Frankfurt, a bustling and modern metropolis and end in Ludwigsburg, a city of many different faces from being a center of education, culture, and history to also being a major industrial center. The Residential Palace located here is one of the greatest German Baroque palaces in existance today with 452 rooms and 28 buildings. 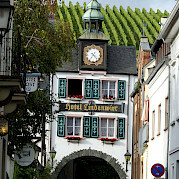 For a list of all of our cycling tours in Germany click here. Fly to Frankfurt (FRA) International Airport. Frankfurt Airport is well connected by public transportation. Frankfurt Airport Train Station, located next to Terminal 1, offers connections to popular German cities via Deutsche Bahn, the national railway company of Germany. There are local S-bahn lines (lines S8 and S9) that take travelers into central Frankfurt in about 10-15 minutes. From the main train station in the city, it is just a short taxi ride to the boat. From Ludwigsburg back to Frankfurt airport by train is approximately 1.5 hrs, cost approximately €35/person. The German rail site bahn.de is good resource when researching train travel in Germany. Please check local conditions before arrival. A good website to use to research regional weather including average high/low temperatures, average rainfall and more is weatherbase.com. The average high/low temperatures for the area in ° F in September is 68°/51 °. High quality bike helmets are available on board free to use. Please be aware that you will be part of an international group of people, but your tour guide and crew members will always speak English. Electric bikes and tandems available for €25 per day. Before you travel, please check your country's passport and visa requirements and the passport and visa requirements of the country/countries you plan to visit. For US citizens, the US Department of State website is a good source of information. The Country Information tab in the International Travel section provides details about passport validity, blank passport pages required, etc. On the beautiful Merlijn, a comfort plus class ship. 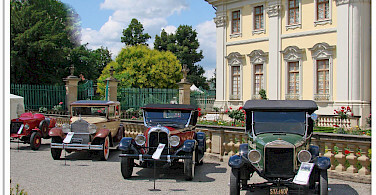 Extra nights are always recommended in either Frankfurt or Ludwigsburg! This is an easy, guided bike and boat tour with average daily distances between 16 to 30 miles (26 to 45 km). *All distances are approximate. The above planned itinerary is subject to change due to changing wind and weather conditions and other unforeseen circumstances having to do with mooring requirements, etc. You are welcomed on board the Merlijn with a welcome cocktail. The afternoon is free, allowing you to explore Frankfurt, with its modern buildings, museums, and lively shopping center. Dinner and overnight in Frankfurt. While you enjoy your breakfast, the Merlijn takes you a little further downstream the Main River. Your bike tour leads you partly along the Main river and then you cross the Rhine river into Mainz, where you meet the Merlijn. Mainz has beautiful squares, half-timbered houses, and impressive baroque churches. 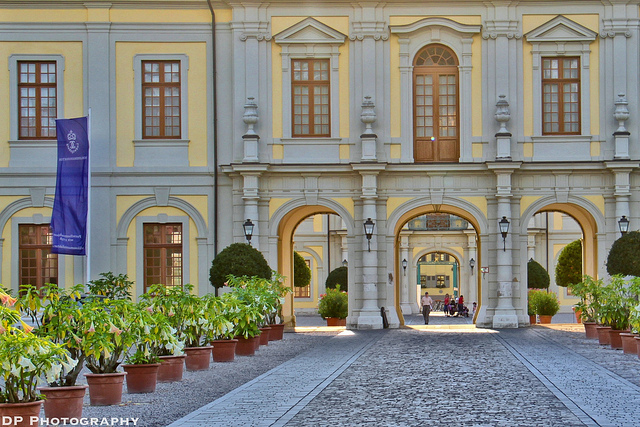 Behind Rococo Façades and in Baroque houses hide inviting elegant boutiques, cafés, and ‘Weinstuben’. And of course there’s the famous Cathedral of Mainz you shouldn’t miss. Tonight you will enjoy your dinner in one of the many restaurants in Mainz. This morning you will explore the city of Mainz a little more before you bike to Nierstein. Here you will enjoy a tour through the vineyards including a wine tasting. You will have marvellous views of the Rhine river and surroundings. Today the bike tour starts from Worms along the Rhine river and later on you will follow the Neckar river to Heidelberg. You will enjoy your dinner tonight at your own expense in one of the many local restaurants in Heidelberg. In the morning there will be a guided city walk through the historic center including the castle. Afterwards you will bike from Heidelberg via Ziegelhausen to Neckargemünd. 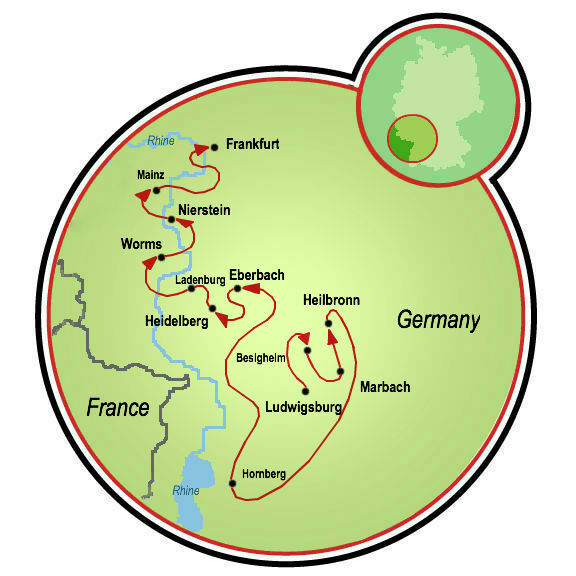 The tour continues through the southern part of the Odenwald to Neckarsteinach. Our next stop is Hirschhorn, one of the pearls on the Neckar river. 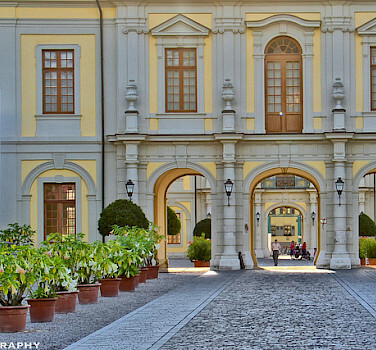 Hirschhorn has a charming castle, a Carmelite Monastery and an interesting Market Church. 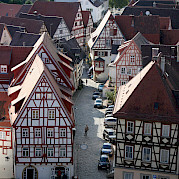 Our tour today ends in Eberbach, a charming village with quiet narrow streets. 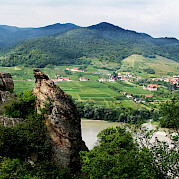 After breakfast you bike to Neckarzimmern and make a short tour towards the castle of Hornberg. 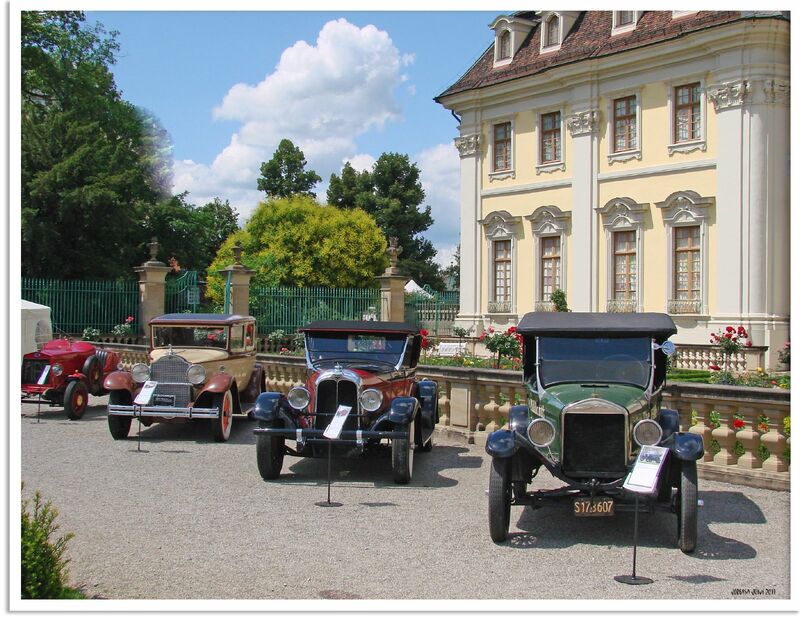 This castle is to be considered as one of the most beautiful castles in the Neckar valley. After 1259 the bishop of Speyer had his quarters here and in the 16th century it became the house of Berlichingen. The bike tour follows the Neckar River to Bad Wimpfen, where you will board the Merlijn. Together you sail to Heilbronn. While you enjoy your sailing breakfast the Merlijn will take you to Besigheim. This is where your bike tour starts on the right bank of the Neckar river to Benningen. Here you can see Roman history in the Castle Vicus. If you're looking for a different flavor, check out our full list of bike and boat tours or view all our featured bike trips, specials, and news. This tour is run by Jantien Wondergem and Henk Karelse. Our boat staff were very friendly and competent and really made the effort to make sure that you were enjoying yourself. Jantien, our boat den mother and chef always made you feel so welcome and cared for. And Jacques, our guide was so knowledgeable and passionate about all the history and scenery. Absolutely a memorable experience all around. Thank you. It was magical from start to finish, the personalized service for our group of 22 was amazing , we loved it! Jantien was amazing! She was always available, ready to help in anyway, answer questions, run a tidy and very clean ship... in short, do anything to make our stay pleasant and stress free. It was obvious she was genuinely concerned for the happiness of her, as she called us, "Dear Guests". We looked forward every day to her well thought out and wonderfully prepared evening meals. The staff were all highly focused on the same things, a testament to Jantien's leadership. We have no hesitation in recommending Jantien and the Merlijn. 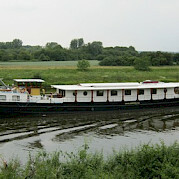 Jantien & Henz were supreme hosts and their barge Merlijn delightful. As for tips just sit back, relax & enjoy the marvelous holiday that they provide. Merlijn Germany, Netherlands Deluxe Class Boat The Merlijn has 12 luxurious cabins with two comfortable airbeds that can be pushed together or separated, a desk, a wardrobe closet, a hairdryer, and a safe. The lounge is comfortably furnished in a modern style with a restaurant area and lounge near the bar. You can enjoy fresh air, water, and nature in all weather on the sun deck. The entire ship is climate controlled and you can adjust the temperature in your own cabin.